The climate train has left the station. Dirty Coal, at it again! Video - Contraction and Convergence animation from "The Age of Stupid"
This animation from The Age of Stupid is a quick and concise explanation of the concept of Contraction and Convergence, a framework for the equitable powerdown from our disastrous oil dependence. "Contraction and Convergence, C&C, is a scheme to provide a framework for a smooth transition to a low level of CO2 emissions from human activity. It can either follow or replace the Kyoto protocol. The first step in C&C, 'Contraction', is based on agreeing a safe target concentration level and the determination of global annual emissions levels into the which should take the atmosphere to that target. We assume that what is 'safe' would be determined by an international agreement, probably by the UNFCCC acting under guidance from the IPCC. A profile of plausible annual emissions levels can be set by GCI's CCOptions model. We project forward to 2200. Having defined a global budget, the second step, 'convergence' defines allocations to each country. CCOptions assumes that each country is assigned annual allowances which vary, per capita, linearly, starting from actuals in 2000 and converging to a common level of per-capita emissions in a target year. This target year need not be the same as the contraction target year and is a likely topic for political negotiation. A cap year can be set so that population growth after that year does not accrue additional emissions rights. The C&C package is expected to be completed with an emissions-trading mechanism and with a governance framework including penalties for non-compliance." Since I got back to England I've been trolling the used book shops for books on Permaculture. I finally found one at my friend Brian's bookshop yesterday and what a find! "Permaculture: A Practical Guide for a Sustainable Future" by Bill Mollison, a tome, large hardbound 579 pages. So my plan is to spend an hour every morning studying and keeping notes, particularly as they apply to our specific project. I will endeavour to post occasional updates on what I'm learning and the development of the plan. "Rob Hopkins reminds us that the oil our world depends on is steadily running out. He proposes a unique solution to this problem -- the Transition response, where we prepare ourselves for life without oil and sacrifice our luxuries to build systems and communities that are completely independent of fossil fuels." I remember a debate I had as a young man with a friend of mine who was making his living in the stock market. He advised me to invest in banks and to learn the ways of the trader. I admonished him for being involved in an industry that rewarded companies for firing people, for putting people out of work when they had families to feed, all in the interest of short term profits. I felt, as I still feel, that an economy that grows by reducing jobs was nonsensical, unethical and unsustainable. I wanted no part of it. For all the years in between, endless growth as an economic model has been gospel and any attempt to discuss the obvious fact that we live on a limited world of resources upon which our economy and our very survival is completely dependent was met with looks of disbelief. One never heard any mainstream discussion of this problem, until now. Tim Jackson, Professor of Sustainable Development at University of Surrey and Economics Commissioner to the UK Sustainable Development Commission, (click here for bio) is advising the Labour Government, at their request, that we need to redefine what we call prosperity and find a new path there, one that doesn't involve consumerist materialistic growth! You can download his report here, the most downloaded report in the history of the Commission. 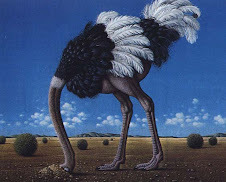 Meanwhile the fox still owns the henhouse in the US, the banksters remain firmly in control, steering the debate away from any serious discussion that the entire foundation of the economy is built on sand. Like Zombies in a Romero film, arms raised intoning "must protect the rich, must protect the rich...."
"Is our economy fit for purpose in a low carbon world? Can economic growth deliver us from the threat of catastrophic climate change, or is it the engine thats driving us relentlessly towards it? Speaking today at a high-level debate in central London to mark the publication of his controversial new book Prosperity without Growth, Tim Jackson argues that building a new economic model fit for a low carbon world is the most urgent task of our times. The current model isnt working, says Prof Jackson, a top sustainability adviser to the UKs four governments. Instead of delivering widespread prosperity, our economies are undermining wellbeing in the richest nations and failing those in the poorest. The prevailing system has already led us to the brink of economic collapse and if left unchecked it threatens a climate catastrophe. Prosperity without Growth substantially updates Jacksons groundbreaking report for the Sustainable Development Commission. Launched earlier this year to great acclaim, the report rapidly became the most downloaded document in the Commissions nine year history and in recent weeks has contributed to a burgeoning debate about economic growth and its consequences for people and planet. As world leaders prepare to meet in Copenhagen to forge a new climate deal, Jacksons analysis provides a salutary warning against complacency. Global carbon emissions have risen 40% since 1990 and will continue to rise inexorably unless action is taken urgently. By the year 2050, the carbon content of each dollar of economic activity will need to be a staggering 130 times lower than it is today, if we are to make room for much-needed development in the poorer nations and remain within a 2oC warming. By the end of this century, well need an economy in which each and every dollar of economic activity is taking carbon out of the atmosphere, says Jackson. What does such an economy run on? What does it look like? What kind of economic activities take place in such a world? Nobody knows the answer to these questions. But its fanciful to suppose we can achieve such a transformation without seriously examining the dynamics of the growth-based model. Jackson admits the task is not a trivial one. We are caught in a profound dilemma, he suggests. Economic growth is the default mechanism for achieving social stability. And at the same time it drives the scale of ecological damage. Whats needed now is an urgent commitment to building a different kind of economic system, one which puts people and planet at its heart, Jackson claims. For the advanced economies of the western world, prosperity without growth is no longer a utopian dream. It is a financial and ecological necessity. Prosperity Without Growth: Economics for a Finite Planet (Earthscan, £12.99) is available from all good bookshops and www.earthscan.co.uk "
"In 4 minutes, atmospheric chemist Rachel Pike provides a glimpse of the massive scientific effort behind the bold headlines on climate change, with her team -- one of thousands who contributed -- taking a risky flight over the rainforest in pursuit of data on a key molecule." "FARMWORKERS TODAY: Approximately 2-3 million farmworkers feed our nation every day, working under some of the harshest and most dangerous conditions found in any industry. This is a glimpse into the hard realities that a vast majority of these workers face on a day-to-day basis. For more information on the fair food movement in the US and to see other chapters of this project please visit: fairfoodproject.org. " Who puts the food on your table? Take action on this issue over at Organic Consumers Association. A train loaded explosives and toxic chemicals pulls into a lonely country station outside a major metropolis. It is midnight. The engineer steps off to get a cup of tea, when he returns he sees that the train has started rolling down the line and is just going out of sight around a bend. Now he knows this stretch of track well. Up ahead, the grade continues to steepen, downward toward the sleeping metropolis. He knows that the train will continue to pick up speed unless it is derailed soon. He also knows that the longer he waits to do something the deeper into settlements it will get and therefore will cause much more damage and loss of life when it does finally crash. What should he do? What would you do? Should he say, "not my problem" and just sit and quietly drink his tea? Should he walk to the station office and try to raise someone else to deal with it? Should he use his cell phone to call his superiors to determine the best course of action? Or should he immediately call emergency services and mobilize quick and decisive action to derail the train as soon as possible? Now imagine you are one of the folks living near a sharp bend a few miles down the track at the bottom of the grade, comfortably snoozing away as the train hurtles your direction. What would you like him to do? Of course, the train is the climate and we are watching it roll around the bend. The folks sleeping near the tracks are our children. What do we do? What will you do? 2. Detach from consumerism, we are literally consuming the support systems upon which we all stand and the waste products are killing us as we fall. 3. 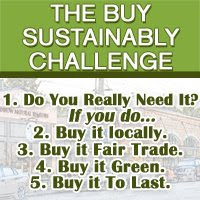 Learn to live more sustainably, set an example for your neighbors. 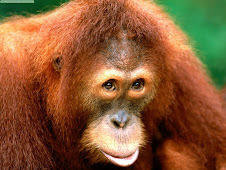 Reduce car driving, meat consumption, flying, use of palm oil, the human population. Increase local organic food consumption, how much food you grow, your production and conservation of energy, use of public transit or even better, human powered transport, the efficiency of your home. 4. Get involved in the climate change work being done in your community, start or join a transition initiative, write to your local paper, get active in preventing deforestation. Thanks to Professor Richard Leakey for the train analogy. He used it in a lecture entitled "Climate Change and the Future of Life on Earth" delivered on May 30th 2009 at the Royal Ontario Museum and broadcast on Big Ideas. Video - Princes Rainforest Project - Prepare for Crash Landing! "This clip explains what is happening to the planet as a result of rainforest deforestation. Using images and graphics this film explains the importance of the forests and why we must stop destroying them before its too late. " Transition Bermuda solar batch heater wins an innovation award! I spent most of the last 6 months in Bermuda volunteering with a group of locals to get a Transition Initiative going while my wife was working in the local schools doing supply work, substitute teaching. In February I built a solar batch heater from recycled materials and installed it at the guest house where we were staying. When I tested it, in October on a partly cloudy day, I discovered that it was reducing electricity demand for hot water by an average of 25%. With electricity approaching 50¢kWh on the island that represents a significant savings and means that the unit will pay for itself in under two years as the only costs were the plumbing supplies. Recently, the local environmental group Greenrock, ran an innovation in sustainable construction competition as part of Global Entrepreneurship Week. We entered the unit as a Transition Bermuda project. Our hope being that at the very least it would help gain publicity for the initiative and might even win. In the final judging it was up against some stiff competition, several by professional architects; wood housing to reduce concrete use, prefab housing made from shipping containers, and a device that is used to determine site suitability for solar PV and microwind installations. But we won! Last night my wife did the presentation at the final judging and it won $1500. The money will go to the initiative, hopefully to fund classes to teach folks how to build the units. The design needs much refining but works as is. 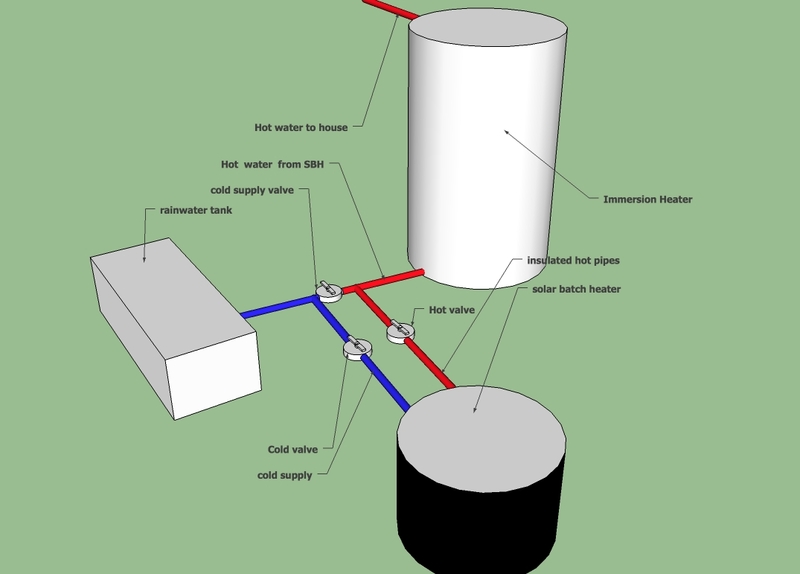 The plumbing diagram indicates that the unit is plumbed into the cold side of the immersion heater which sees hot water coming in so needs not come on as often. It is lower than the main tank as well which enables a thermal convection loop, circulating hot water out of the solar tank as it heats. This means the immersion heater stays warm longer as it doesn't rely exclusively on the main circulation pump for the system to deliver hot water to it. Here is the text from the entry document with more details about the project. Transition Bermuda seeks to increase the resiliency of Bermuda by fostering and promoting a reduction in fossil fuel dependence, a return to local economy and self sufficiency, and the rebuilding of healthy community that comes with self reliance and local interdependance. The prototype as built was designed according to the materials available at the time and tools available to be borrowed. • How well does it respond to Bermuda’s unique building environment? The salient point about Bermuda’s building environment that it is almost totally unsustainable. It does not use any significant amount of local materials. As buildings and appliances from buildings are replaced there is no significant recycling system for the materials. This valuable resource ends up in the land fill or up the incinerator stack. Built with very little mandated attention to efficiency, buildings here are completely reliant on imported energy. Additionally, construction labor is very expensive due to the high cost of living. This project addresses all those issues, it reduces the reliance on imported energy by reducing electricity demand for hot water. It is constructed of recycled materials, thus reducing imports and waste to the dump. It is powered renewably and passively by the sun. It is easily built by anyone with a modicum of skill with tools thus reducing the cost of deploying renewables. • How much does it contribute to energy savings? Unit as built was measured to reduce electricity usage for hot water by 25% over 24 hrs on a partly cloudy day as compared to usage with solar batch heater out of the plumbing circuit. Water usage on both days was comparable relative to time of day and quantity used. Clearly on cloudy days performance suffers but this is more than offset by number of full sun days. I predict for the guest house where it was built, a savings of at least $115 per year thus paying for itself in 1.5 years. • How broadly can the idea be applied? 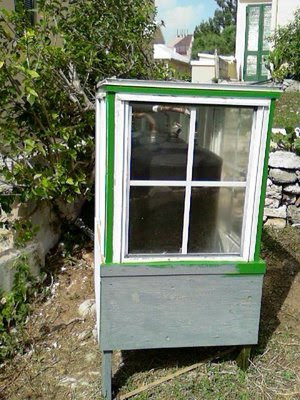 There is no reason this type of solar batch heater could not be deployed on the majority of homes and businesses in Bermuda. The only limitation is the supply of old immersion heaters, glazing, lumber, and styrofoam packaging currently going to waste. We've been paying the environmental and health costs of using dirty coal to generate electricity while the dirty coal industry reaps the profits and leaves it's filth for us to clean up. From formerly beautiful appalachian valleys and streams now choked with the blasted refuse of mountaintop removal, to the effects of climate change drying out the west, drowning the east, and threatening to overwhelm our meager attempts to change. And now here we have finally drafted a climate bill, not an ambitious one but a first attempt upon which we can build, and what does the dirty coal industry do? They write a letter, through their humble servants in government of course, to see to it that they continue to be given an out for the damage the cause, they want free permits to emit carbon! What do they think a climate bill is about? read more over at Care2Causes. While the IEA has been seen to admit Peak Oil in recent years they have been intentionally overinflating figures to suit US foreign policy aims, this according to a story in the Guardian. Not much to say about this, read the article over at the Guardian, it is not surprising, and doesn't change the facts. It is beyond time to get over our addiction to oil! This panel discussion, titled "Corporate Leadership: How Smart Firms are Making the World Better and Safer," explores making the business case for action on sustainability and restorative practices. Examples show that the premise that businesses that are doing "good" and are also doing well by it. I'm searching for a business model I can believe in. I'll need to make a living when we set up in the states and I'm determined to do it in a sustainable way. Increasingly though, I've become convinced that the words sustainable and business don't go well together. We are beyond the point where we can afford to invest in products and practices that don't directly increase the sustainability of our ecosystem. Any purchase or manufacture of a product that doesn't do this is part of the problem, not the solution. For example, building green cars is a misdirection, we should be finding ways to do without cars wherever possible and rectifying those situations in which a car is necessary to one in which it is not. The amount of energy used to build a car, the embodied energy, will far exceed the savings involved in driving such a vehicle. That is not to say that cars shouldn't be built to be more efficient. They should, but should we artificially stimulate a market for them when we already have too many cars? This was what cash for clunkers was all about. But our mindset has not shifted in any significant way. The 2008 green car of the year was the Chevrolet Hybrid. It weighs more than an elephant! How can driving a car that heavy be considered in any way green when we have the technology to make lightweight hyper efficient vehicles? 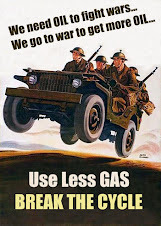 Yes it improved it's fuel efficiency by 30% but still only gets 21 mpg. That is not progress. That is not green. "is based on the idea that its products or services will improve people's lives qualitatively, not quantitatively. It should provide a product or service that helps people develop their lives, and not merely increase the amount of their possessions. The smaller the business, the easier it is to internalize this distinction." When we realize that climate change will increase hardships for everyone, except perhaps the rich who can afford irresponsibility, can any product that increases the likelihood of climate change be said to "improve people's lives qualitatively"? So what are some examples of restorative business? Preventative medicine, which aims to foster good health, as opposed to allopathic medicine, which depends on sickness and symptoms to treat; organic farming which sequesters carbon while producing food that produces health as opposed to industrial agriculture which does neither; renewable energy which produces energy without carbon emissions and has a high energy return on energy invested as opposed to fossil fuels that when the EROI of climate is factored in has a negative return; building bicycles, the most efficient form of transport known to man, education in self sufficiency skills and how to reduce dependence on the global economy; building things from recycled materials; restoring biodiverse ecosystems; these are all examples. But is there room for this model in American corporate culture? You can see a discussion about this from the Rocky Mountain Institute conference on April 10 2009 in the video I've posted just previous to this post. Many of the examples in this video are truly on the leading edge of sustainability in business, the question remains, do we really need any of it? I don't personally need carpet, I do buy outdoor gear and Patagonia sets the standard in that business. I suppose I have to cloth myself but I will continue to purchase used clothing when I can, wear everything till it falls apart, and will think more carefully before I buy a piece of new gear. So what am I to do when I get to the states, our plan is to focus on making our lives as sustainable as possible while looking at business options that enable us to help others do the same. "Thrown, dropped, mutilated, and ground-up alive. This is the disturbing reality faced by hundreds of thousands of chicks each day at the world's largest egg-laying breed hatchery Hy-Line International in Spencer, Iowa. New hidden camera footage obtained at this facility during a http://www.MercyForAnimals.org undercover investigation gives a disturbing glimpse into the cruel and industrialized reality of modern hatcheries. The warm, comforting, and protective wings of these newly hatched chicks' mothers have been replaced with massive machines, quickly moving conveyor belts, harsh handling, and distressing noise. These young animals are sorted, discarded, and handled like mere cogs in a machine. For the nearly 150,000 male chicks who hatch every 24 hours at this Hy-Line facility, their lives begin and end the same day. Grabbed by their fragile wings by workers known as "sexers," who separate males from females, these young animals are callously thrown into chutes and hauled away to their deaths. They are destined to die on day one because they cannot produce eggs and do not grow large or fast enough to be raised profitably for meat. Their lives are cut short when they are dropped into a grinding machine tossed around by a spinning auger before being torn to pieces by a high-pressure macerator. The callous disregard for animal welfare at this facility is not isolated. In fact, the conditions documented during this investigation are completely standard and acceptable within the commercial egg industry. Referred to by Hy-Line corporate leaders as mere "genetic products," these chicks are treated just as they are viewed as inanimate objects, rather than the sentient creatures they are. Driven by consumer demand, the egg industry will continue to exploit, abuse, and kill day-old animals as long as doing so remains profitable. Empowered consumers can put their ethics on the table by choosing kindness over cruelty at each meal by adopting an animal-friendly vegan diet. " Half measures won't cut it! Business as Usual is out. Perception is everything - we still see human civilization as separate from nature. The past 8 generations of humans have lived in a completely anomalous phase, that of growth without bounds - as an ecologist he would see this happen in any other species and call it a plague phase and it would inevitably result in implosion. We see it as normal even though it is completely abnormal. We have an intellectual understanding of the dilemma we face but our response to it is to make it worse by assuming we can green grow our way out of it. Assuming we can maintain growth through technological improvements, essentially "technology will save us". This is delusional. The science, which is ignored in the above, says we need an absolute reduction of throughput of material resources in our economy of 80% by mid century. Any effort, whether personal or governmental that does not take that into account by bringing about an absolute reduction in use of resources is making matters worse, this includes green consumerism, recycling, etc... For example, the 2008 Green Car of the Year, the Tahoe hybrid, gets the lowest gas mileage of any hybrid on earth and weighs 3.3 metric tonnes. Clearly rushing out and buying one of these behemoths is not saving the planet. This perpetuates the illusion that cities should be built around automobiles. Additionally, from 1950 to 2004 the average American house increased in size by 135%. This was the time that the environmental movement was born, green rhetoric increased and family size decreased. A tiny fraction of these houses are about 25% more efficient than the previous houses. The point, it is completely delusional to think we are improving the situation. Modern cities, if sealed off in a giant dome, would suffocate and starve simultaneously. No matter how green, they are in no way sustainable. We are not producers, we are parasitic consumers according to Mr. Rees. Every act of human production consumes vast quantities of resources. In contrast, balanced ecosytems are exactly that, balanced. This abnormal period of growth has been enabled by a period of stable climate and an inheritance of millions of years of eco capital. The climate is no longer stable and the capital (including oil and soil) is no longer there for us to use in anything like the quantities we have come to expect. Real data indicates that CO2 concentration is increasing 35% faster than expected in the worst case scenarios predicted in the year 2000. The rate of increase is doubling. One of the most respected climate research centers, The Hadley Center in the UK recently predicted we are unlikely to keep concentrations below 650 ppm without herculean efforts. That means at least a 50% chance of a 4ºC increase over the pre-industrial levels, this is catastrophic climate change. No country on earth is even coming close to addressing the levels of change required. And now I quote Mr. Rees. "There is no particular virtue in becoming more efficiently unsustainable"
To hear the full lecture from Mr. Rees go to Radio Ecoshock or go directly to the mp3 file at Smart Decline. "We have inherited a whole set of solutions by conventional wisdom, many of them surrounding lifestyle choices. Almost all of us believe that someone who buys local food, who drives a hybrid, who lives in a well-insulated house, who wears organic clothing and who religiously recycles and composts and avoids unnecessary purchases is living sustainably. They are not. As we've explored a bunch of times in different ways here on Worldchanging, the parts of our lives that actually fall within our direct control are the tips of systemic icebergs, and often changing them does nothing to alter those systems: not individually, not in small groups, not even in larger lifestyle movements. If we're going to avoid catastrophe, we need to change those larger systems, and change them for everyone, and change them quickly.... We can no longer afford to mistake the symbolic for the effective, or put our hopes in the mystical idea that if enough of us embrace small steps, our values will ripple mysteriously out through the culture and utterly transform it. We've been saying that for more than 40 years, it hasn't happened and we need to stop lying to ourselves that it will. Live the life that fits your values, but don't mistake that for changing the world." I agree, the symbolic is vital but it certainly isn't adequate to the task. This brings me to the main point of today's post. A fundamental change in the energy density of our society is coming. We can wait for it to happen to us with all the attendant chaos that implies or we can plan for it. We need to go for the big targets first, where are the biggest emissions coming from, Coal and oil fired electricity generation, industrial agriculture, and oil fueled transport. All three require government intervention to rectify. That won't happen if you don't get involved to make it happen. If you live in the US take the example from the UK where protests have caused Eon to shelve it's plans to build a new cola fired plant at Kingsnorth and Greenpeace protesters continue to occupy existing stations as well the roof of the Houses of Parliament. At the very least let your government representative know that you support strong climate targets, the cessation of construction of all fossil fuel powered power stations, the cessation of mountaintop removal and the cessation of the exploitation of the Alberta Tar sands. Go to a "Coal Country" house party to get educated and find others in your community that are involved in stopping dirty coal. Realize that these actions are requiring a severe reduction in fossil fuel use in a very short time. It is important for the symbolic power but also for your own security that you powerdown your own life. Go car free, grow your own food, go off grid for your electricity, harvest rainwater, eliminate waste and debt fueled globalized consumerism from your life, start or join a Transition initiative to help your community powerdown and relocalize. Where does the electricity you use come from? "We don't live where they mine coal. They mine coal where we live.... Our concern today is our homes, our environment, and the sustainability of the environment." Lorelei Scarbro's house in the little community of Rock Creek, West Virginia is the same house her husband built with his own two hands when they were married, on land handed down to him from his parents. They raised their children in this house. Lorelei watches the deer in the field below, enjoys a fresh mountain stream running by the property and says that her granddaughter takes particular delight in the wild turkeys that frequent the neighborhood. Her husband, a coal miner for 35 years who died of of black lung, is buried in the family cemetery next to their home. Lorelei's property in Rock Creek borders Coal River Mountain, one of the most beautiful mountains in the Coal River Valley of West Virginia, and one of the few untouched mountains in the region. Miles of pristine creeks and waterfalls, horseback trails and stunning vistas are often overlooked as a prime eco-tourism location. Now Coal River Mountain is slated for a mountaintop removal coal mine. If the coal company's plans go through, nearly 10 square miles of the mountain will be destroyed, and 18 valley fills will devastate the Coal River watershed. But residents in the Coal River Valley have joined together to propose a new idea - one of sustainable energy. In 2006, a study of the wind potential on Coal River Mountain demonstrated that the mountain is an ideal location for developing utility-scale wind power. The proposed Coal River Wild Project would produce enough wind power to keep the lights on in 150,000 homes, pump $20 million per year in direct local spending during construction, and $2 million per year thereafter. It would create hundreds of jobs and allow other uses of the land that would benefit local communities. Sustainable forestry, tourism, and harvesting of ginseng and other wild plants are just a few options for Coal River residents that would ultimately preserve the natural environment of Coal River Mountain for generations to come." "The movie that started it all! The Meatrix (www.themeatrix.com) spoofs The Matrix films and highlights the problems with factory farming. Instead of Keanu Reeves, The Meatrix stars a young pig, Leo, who lives on a pleasant family farm... he thinks. Leo is approached by a trenchcoat-clad cow, Moopheus, and joins him on a journey to learn more about what goes on behind closed barn doors at factory farms. The Meatrix was created and produced by Sustainable Table (www.sustainabletable.org) and Free Range Studios (www.freerangestudios.com). " "The Meatrix continues with The Meatrix II: Revolting! The second installment of the Meatrix (www.themeatrix.com) features three superhero farm animals including Leo, the young pig who wonders if he is "the one," Chickity, the feathered family farm defender, and Moopheus, the trench-coat clad cow with a passion for green pastures. The sequel delivers even more action, adventure, and humor than the first as the three plunge into the revolting reality of industrial dairy farming. The Meatrix II: Revolting was created and produced by Sustainable Table (www.sustainabletable.org) and Free Range Studios (www.freerangestudios.com) "
"Taking the fast out of fast food! The action continues in the Meatrix 2.5 (www.moremeatrix.com) as our heroes Moopheus, Leo, and Chickity learn firsthand about the problems with meat processing. Picking up from their last adventure at a dairy farm, Leo and Chickity attempt to rescue Moopheus, who has been kidnapped and taken to a slaughterhouse. Produced by Sustainable Table (www.sustainabletable.org) and Free Range Studios (www.freerangestudios.com) for Participant Productions and their Fast Food Nation social action campaign (www.particpate.net/fastfoodnation). "